At its core, a fish finder is simply a tool designed to provide anglers with more information than they could otherwise access. But the amount of information provided by various fish finders varies greatly. Those designed for novice and casual anglers typically provide very rudimentary data, such as bottom depths and crude images of fish swimming below the boat. But other fish finders, such as the Humminbird HELIX 10 CHIRP MEGA SI GPS G2N and the rest of the HELIX 10 Series, are made for advanced anglers, who can leverage the wealth of information they provide. These types of sonar units provide detailed images of the fish and a plethora of additional information about the world beneath the waves. Given the diverse array of features the Humminbird HELIX 10 Series offers, and the capabilities each individual model in the lineup provides, Fishing Tech gives the HELIX 10 Series an A rating. And, because the HELIX 10 CHIRP MEGA SI GPS G2N provides almost every bell and whistle an angler could desire, we give this model an A+ rating. The Humminbird HELIX 10 CHIRP MEGA SI GPS G2N provides all of the basic features common to lower priced fish finders, as well as a few high-end features, which will allow you to take your fishing to the next level. Three of the most noteworthy features included with the unit are detailed below. Unlike many other imaging technologies, which rely on relatively low-frequency pulses to collect data, the CHIRP MEGA SI GPS G2N emits very high frequency signals (sometimes triple the frequencies produced by other units). This allows incredible amounts of detail, allowing you to image individual rocks or fish below or beside your boat. The HELIX 10 CHIRP MEGA SI GPS G2N provides remarkable 360-degree views around your boat. This allows you to concentrate on catching the fish on your display screen, rather than piloting your boat around, trying to obtain this kind of information manually. While using the 360-degree function, you’ll be able to see all of the fish and hard objects within 300 feet of your boat. With the CHIRP MEGA SI GPS G2N, you will no longer have to move back and forth from the bow to the console when you want to mark waypoints, zoom in or scroll through various screens. Instead, you’ll have complete wireless control of the fish finder, enabling you to keep fishing while still operating your fish finder. Humminbird produces a number of different fish finder series, which primarily vary by screen size. Within each series, the individual models offer a variety of different options, enabling anglers to select the best fish finder for their own needs. Generally speaking, the HELIX Series with larger screens provide more advanced capabilities, and the Humminbird HELIX 10 Series is no exception. One of the largest screen sizes in the entire HELIX lineup, the HELIX 10 Series fish finders are available in four different option packages. All of the models in this series provide GPS and chart-plotting capabilities, and they come pre-loaded with ContourXD Maps. They also feature CHIRP and DualBeam PLUS sonar technologies to provide you with high-quality images, which are displayed on the 10-inch, HD screen. As you can see, the primary differences between the various models relates to the presence or absence of CHIRP down imaging (the HELIX 10 CHIRP GPS G2N does not provide down imaging, while the other three members of the product line do), and the presence or absence of MEGA imaging. Additionally, the CHIRP MEGA SI GPS G2N includes side- and down-imaging capabilities, while the CHIRP MEGA DI GPS G2N only provides down-imaging. All of the Humminbird HELIX 10 Series fish finders come equipped with a number of important and helpful features, and the HELIX 10 CHIRP MEGA SI GPS G2N is the best-equipped model in the series. Some of the features it provides are detailed below. The CHIRP MEGA SI GPS G2N (like several other models in the HELIX line) features two SD card slots. This makes it easy to save information from your fish finder or access additional maps and navigation charts. Unlike some other models, which place the SD card openings on the side of the unit, the SD cards for the CHIRP MEGA SI GPS G2N are located on the front, providing very easy access. SwitchFire Sonar enables you to customize the amount of information and detail displayed on the screen. There are two different modes you can choose from: Clear and Max. Clear mode is useful when you are fishing or traveling through choppy waters, as screen clutter is suppressed, providing a clear view of the underwater world. By contrast, Max mode provides you with the most information possible, which is a great way to get additional detail in clear water. Just because you have a fish finder doesn’t mean it is always easy to locate them. You’ll still have to know the best parts of the lake or river to search for the fish. But the HELIX 10 CHRIP MEGA SI GPS G2N makes this easy with SmartStrike technology. SmartStrike technology analyzes the time of year, time of day and water conditions to provide you with suggestions on the most likely portions of the water to hold fish. It doesn’t matter how much data your sonar unit collects if it doesn’t present this data in a way you can see well. But with the HELIX 10 CHIRP MEGA SI GPS G2N, you’ll never have to worry about this, as it comes with a high-definition, 10-inch color screen, which is easy to see in all weather conditions. You can even change the color display of the unit to help maximize visibility. Fishing isn’t just about finding your quarry and chucking a few lures in the water: You must also pilot your craft in a safe and efficient manner to avoid problems and spend more time catching fish. Fortunately, the HELIX 10 CHIRP MEGA SI GPS G2N features an included high definition radar unit, which will help you steer your craft safely, even in foggy weather or low light conditions. Before purchasing the Humminbird HELIX 10 CHIRP MEGA SI GPS G2N (or another model in the HELIX 10 Series) if is important to see what else the market has to offer. This way, you can be sure to get good value for your dollar and obtain the best fish finder for your needs. This includes both other models in the HELIX 10 Series as well as those made by other manufacturers. The HELIX 10 CHIRP MEGA SI GPS G2N is the most feature-packed model in the HELIX 10 Series, so you’ll have to move up to the HELIX 12 Series to find a better Humminbird product. However, you won’t enjoy many more features in the HELIX 12 Series; the biggest difference is screen size. Accordingly, you’d pay another several hundred dollars to get a similarly equipped Humminbird fish finder with a slightly larger screen. On the other hand, you can save about a few hundred dollars by downgrading to the HELIX 10 CHIRP MEGA SI GPS G2N. You’ll still get a high-definition 10-inch screen, but you’ll have to do without side-imaging capabilities. Because side imaging is such a useful tool, it is hard to justify downgrading if your budget can accommodate the CHIRP MEGA SI GPS G2N. There are a number of fish finders produced by other manufacturers that are similarly equipped and priced to the HELIX 10 CHIRP MEGA SI GPS G2N. This gives anglers a number of different options to consider when selecting a new fish finder. However, we’ll consider two models in particular: the Lowrance HDS-7 Carbon with the StructureScan 3D Transducer Bundle and the Raymarine Axiom 9 CHIRP RealVision. Both units offer most of the same features as the HELIX 10 CHIRP MEGA SI GPS G2N. All three units feature CHIRP technology, a high-quality transducer and all of the mounting equipment you’ll need. They also offer scanning sonar technology, including down- and side-imaging capabilities. The Raymarine fish finder provides wireless connectivity, as well as GPS and chart-plotting capabilities, just like the Humminbird HELIX fish finder does. The Raymarine fish finder also features RealVision 3D sonar and a touch screen interface, which many anglers seem to prefer. However, the display screen is one inch smaller than that of the HELIX 10 CHIRP MEGA SI GPS G2N. The Lowrance fish finder lacks GPS and chart-plotting capabilities, and it does not provide WiFi connectivity. Additionally, the Lowrance HDS-7 comes with only a 7-inch screen, rather than the much larger 10-inch screen of the Humminbird model. Given the larger screen of the HELIX 10 Series fish finder, WiFi capabilities and chart-plotting features, it clearly rises above both of these alternatives. In fact, the only real advantage either of these other fish finders possess is the Raymarine’s touch screen. Accordingly, most anglers will be much happier with the Humminbird product. Anglers who are looking for a fish finder in the mid-$1000 price range will have difficulty finding a better option than the Humminbird HELIX 10. It has every major feature you’d expect in a fish finder at this price range, as well as a larger display screen than many comparably priced options. 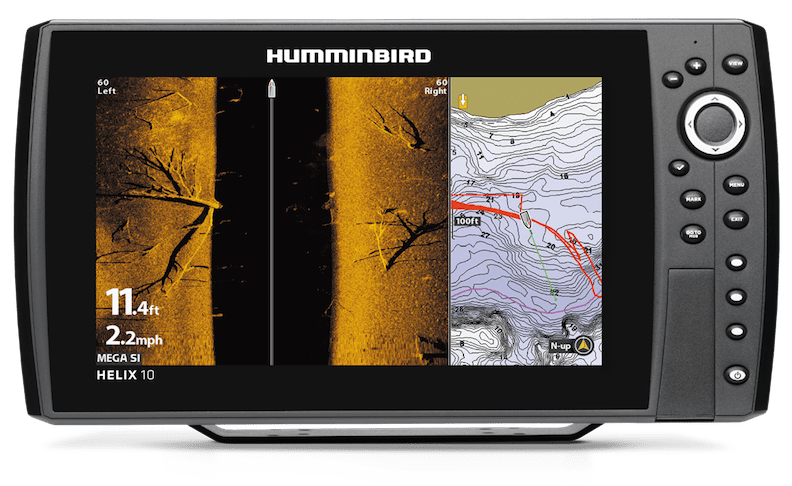 Given the large display screen, side-imaging capabilities and numerous ways to upgrade the unit’s software and connect it to other devices, Fishing Tech gives the Humminbird HELIX 10 CHIRP MEGA SI GPS G2N an A+ grade, and the entire HELIX 10 Series an A.